Reblog: When You Feel Like Giving Up.. | Name-Brand Ketchup. Reblog: When You Feel Like Giving Up..
Reblog from Mr. Blunt and Cranky. William Allison kept this sign for 50 years. 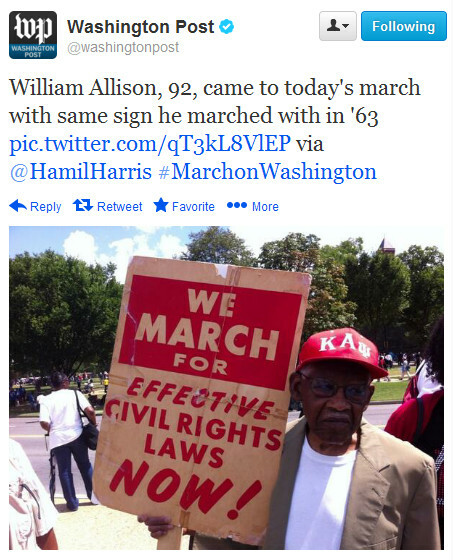 In 1963, he was 42 and participated in the March on Washington for Jobs and Justice. Now he’s 92 and did it again. With the same sign. Let’s all take a breath, nut up, and keep working for what we believe in, love, and cherish. The only way to win is to keep showing up. And the only guaranteed way to lose is to give up.